The obvious response is that for over a millennium, the Roman Mass has been offered in Latin, long after it ceased to be the language of the people. Did this question never occur to anyone before now? Or before the 20th century? The main thrust of the article seems to be that it is difficult, if not impossible, to pray in a language that is not one’s own. Therefore, the individual worshipper cannot actually intend the meaning of the words, and the Mass cannot be a communication of love of God. However, this objection misses two very important realities. When the Catechism says that the Mass is the preeminent prayer of the Church, it doesn’t mean “prayer” as a purely individual, subjective, devotional experience, but WORSHIP, that is offered publicly, corporately, and objectively, the ideal worship that is pleasing to God. This is worship as has been established by the Church, under the influence of the Holy Spirit, taking into account both the human experience of religion, as well being faithful to the new reality that has now entered and embraced the human condition, that is the wedding of the human and divine in the God-Man, Jesus Christ, His Incarnation, his life, and His saving Death, Resurrection and Ascension. Above all the questions of language, form, ceremony, aesthetic, all of which has occupied the Church in the 20th century, through the Liturgical Movement, the early reform of the Roman Rite and its quite radical reform (some would call it a reconstitution!) 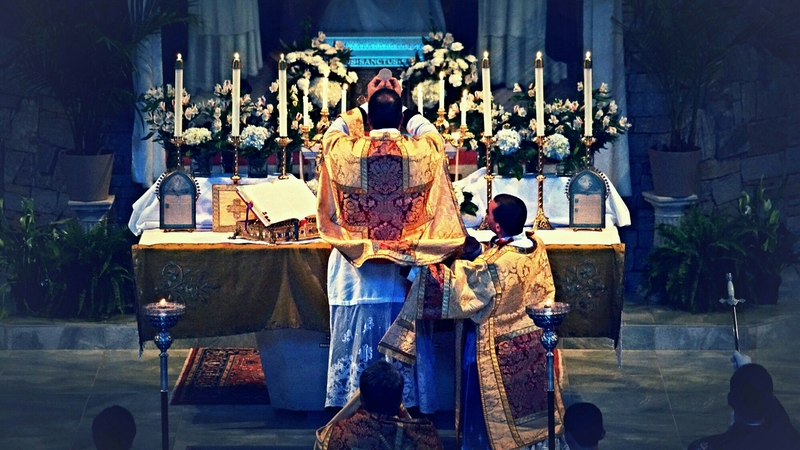 after the Council, this principle remains: the givenness and objectivity of the liturgy, which we enter into, which is a gift given to us, which shapes us and conforms us to Christ and His Mysteries, and not the other way round, which enables us to be so conformed as to live out the Mysteries in our own lives, to be a “living sacrifice” and to offer “spiritual worship.” The evaluation of the use of Latin, or any sacred liturgical language, or the vernacular, should proceed from this principle. That we are so far removed from this principle, that it is not just not understood, but practically unknown, is surely one of the more lamentable things about the state of things in the Church in our day. The preceding guest post was written by Father Gaurav Shroff who is a priest of the Archdiocese of Atlanta. Posted on January 30, 2016, in liturgy and tagged homiletics and pastoral review, latin, latin mass, latin rite, liturgical language. Bookmark the permalink. 7 Comments. Why does it say in the Roman missal the priest turns to the people and says. Are they assuming the priest is not facing the people? But somehow Latin is a language “not our own”..? Right? It could be argued that even when the words are in the vernacular that most people are a long way from a true understanding of the deeper meaning of the words they are saying or reading.